The finest of all Arturo Fuente cigars may in fact be the Don Carlos Cigar. The Don Carlos cigar is rich, spicy, full-bodied and wrappped in aromatic, specially-selected Cameroon wrappers. These cigars offer the cigar lover a pleasing, nutty mix of flavors that deliver sweet tones and spicy complements in each mouthful. The variety of sizes makes the Don Carlos cigar perfect for each individual’s personal preference. Highly rated, this has become a premier cigar over the past quarter century. 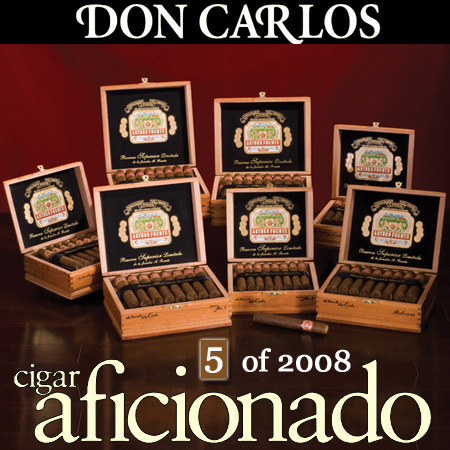 In 2008, the Don Carlos - Double Robusto (Edición de Aniversario) received Top 25 Honors in Cigar Aficionado Magazine, ranking in 5th place. If you haven't yet, try some of these cigars, as they are quite limited and highly demanded.